Do you know that Lady Gaga has more followers on Twitter than the entire populations of Sweden, Israel, Greece, Chile, North Korea and Australia? She literally reaches millions of people with a single tweet. Statistics like this prove that the Internet has become a social environment. What is your company doing to communicate? If you already have a Twitter page, that’s great! You are on the right track. Do you want to make your page even better? Keep reading. 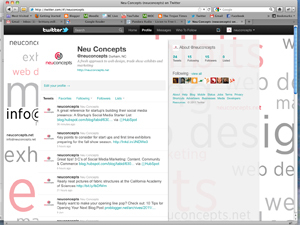 Having a generic Twitter page is a good start, but there is so much more you can do to personalize your page. An easy way to customize your page is by creating a unique background that reflects your brand. Twitter offers a lot of great default background options, but none of them are designed specifically for your company. With a little creativity and your favorite graphics software you can make a big impression on your followers. The best size for a custom background is 1600 pixels by 1024 pixels. The width may seem a little large, but it ensures that your design will fill the display for a variety of screen sizes. In your design, you should include additional contact information, pictures, logos or some form of company branding to help users learn more about your business. A good place for this information is on the left side of your layout in a column that is no more than 150 px wide. If you make your column any larger than 150 px, it will get covered by the Twitter interface when users are viewing your page on a smaller monitor or in a shrunken browser. I would suggest designing a background that is simple so that all the elements of your design can be seen on multiple screen widths. Some simple ideas for your design are a color gradient that reflects your company’s colors, a collage of images or a layout that only uses words that represent your brand. When you are creating your custom layout, be sure to place all of your important information above the 725 px line so that users will not have to scroll to see all of your important information. Once you have your design completed, save the file as a GIF, JPEG or PNG file. These are the only file formats Twitter supports for background images. Also, make sure the file is no larger than 800 KB or it will not be supported. Now you are ready to upload your image! To do this, login to your Twitter account and go to your settings page. Once in the settings page, click on the design tab. After you have saved the changes, you will be able to view your custom background!